Born and raised in the Bay Area, the trio known as the Turf Tytanz know all about the hyphy movement. With 3 unique styles that bring one universal sound, the Turf Tytanz live up to their name. The group consists of J.D. 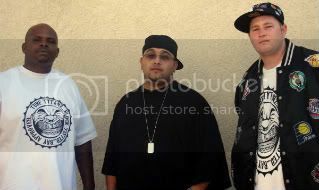 aka J. Deezzy, Nanu aka The Nu, and Bay-Sicc aka El Jefe Nicaraguense. Reppin Hunters Point is Nanu and the Mission District is Bay.Sicc, leaving J-Deezzy to rep the 707 area code in Fairfield. Being influenced by such artists as the late Mac Dre, E-40, Keak Da Sneak, Yukmouth, and many others, the group’s style and lyrics send messages “the bay way”. Whether its telling people to “do the dummy” or just telling you about some of the “trouble in the bay,” this talented group will definitely keep the dj’s spinnin in the clubs and the cars busy at the “sideshows.” Turf Tytans is all about the turf, the hood, the varrio….. and their music reflects that in the lyrics and the energy.